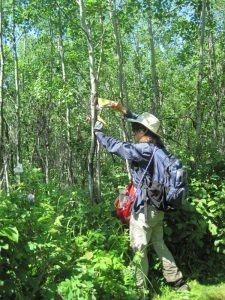 This Wednesday June 22 we worked on a section of Hastings Lake A97 to A95 & Allen Nature Trail – A successful trip for the 8 of us done in less than 3 hours, partly because it is a shorter hike and there is some road. We had the predator brush cutter out for the first time this season and it was marvelous even in the damp grass and brush (Geoff F. had replaced the battery). We replaced a board and added some shingles to boardwalks, added support to a post of a stile as well as the regular trail clearing of mowing, chain sawing, clipping, signing and clearing debris. It was great to be done earlier with such humidity and too many mosquitoes! We ended with lunch at St. Margaret’s church. Karen, I have some photos. I am adding them now.